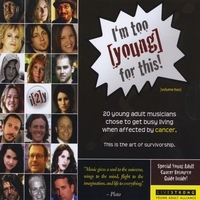 20 young adult musicians chose to get busy living when affected by cancer. This is the art of survivorship. 11. What's It Gonna Take? I'm Too Young For This! Volume 2 features 20 original tracks composed by a brand new community of young adult recording artists who have been directly affected by cancer, either through their own personal diagnosis or that of a loved one. This album, in particular, is toned to specifically address the darker realities of cancer survival in the young adult population in that three of the musicians – Katie Reider, Jeannie Kauffmann and Michael Minton – are being recognized and memorialized posthumously. Founded in 2007 by young adult survivors and for young adult survivors, the I'm Too Young For This! Cancer Foundation is a global leader in the fight against cancer working exclusively on behalf of survivors and their care providers under the age of 40. A TIME Magazine Best 50 Website for 2007, we have helped bring the cause of 'cancer under 40' to the national spotlight and rallied a brand new generation of activists to improve early detection, advocacy, research and support for this forgotten population. "I wanted to create something radically different than other cancer benefit CDs," says Matthew Zachary, iy Founder and young adult survivor. "Instead of simply slapping a pink ribbon on an existing compilation of songs by random pop artists, this project has deeper meaning and purpose as a practical educational tool that not only raises awareness for our mission but fulfills it simultaneously." 100% of all net proceeds benefit the foundation.